"No space for a fresh Christmas Tree? No problem!" 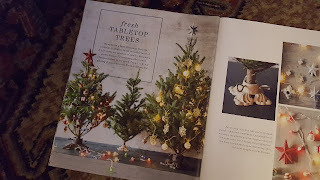 Mahoney's holiday Inspirations book just arrived in my mailbox. It seems our local garden center is on to something "new". Their fresh, tabletop trees are sure to be a hit this holiday season. Who knew that Val was ahead of her time back in 1976? We had a tiny tree that year. That is, the top of a Christmas tree. That was all that would fit. Just months before, my family had moved in to our very unfinished home. That was the summer we had just a faucet of running water in the bathroom tub, no toilet for at least a week and my mother did her best to sterilize bottles on the charcoal grill, for my infant brother. We had been staying in a camper down the street at a campground filled with tourists and teenagers. Posh digs in comparison, but the night I fell out of the bed tucked into the pop-up while sleeping, out onto the leaves and branches without my mother knowing, put an end to our campground adventure. I managed to find my way to the door and gently knock on it, frightening my mother. For all she knew, my sister and I were tucked in safely. Who could be knocking at the camper door in the dark night? She was even more terrified by the realization that her five year old could have easily walked in the opposite direction, getting lost in the deep woods behind the campsite. That was it. Anything was better as long as it had four walls and doors that locked. Five months later, with the luxuries of heat and flushing toilets we were now getting ready for Christmas and living through the building from scratch process. Partially finished rooms with bare plywood floors, woodwork needing to be sanded and painted, splinters were the norm. But thinking back, I have to try really hard -a five year old doesn't care much about an unfinished bedroom. I'm sure it made my mother crazy but she plugged away at it day after day while my father worked three jobs to pay the mortgage and put food on the table. Val painted walls and trim while my brother learned to pull himself up in the playpen by her side. That fall, twenty foot long floor boards stacked in our living room needed to be air dried in the house as they were cut on site from a sawmill in Dennysville, ME and hauled down to Cape Cod by Val's dad, Grampie and his brother, Uncle Bob . The boards had to get acclimated to the house so that they would not shrink after being cut and nailed into place. They were stacked close to four feet high, filling most of the room. With each board spanning eighteen inches wide, this did not leave much space except for an old rocking chair, the ugly green "comfortable" chair and a small, rickety table with a lamp attached that barely balanced on three legs and always threatened to fall over when the dog ran under it scouring for some errant crumbs or chasing our old adopted, stray cat, Sheba. It was a cozy spot especially when the fireplace was lit. One just had to be careful not to let an errant spark from the fresh logs burn a hole in their holiday sweater. So where would we put the tree? Not having one was definitely not an option. My sister Karyn was only nine, I mentioned already that I was the tender age of five and my brother, Ethan, well he was still enough of a toothless blob to barely notice anything, at all except to crawl around and wreak his own havoc. A tree, was a must . There was likely a wreath already on our front door made from greens gathered in our yard and a red ribbon perfectly tied by Val's deft hands. But aside from that and some construction paper and glitter projects made at school, there was little else in the way of Christmas decoration. Besides, there had to be a Christmas Tree! It was likely Christmas Eve by the time my parents were able to scrape up enough cash. 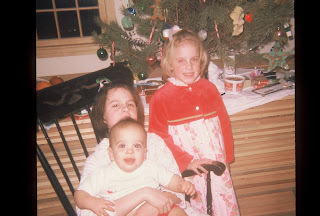 That evening, we all crammed into the powder blue Volkswagen Bug to go pick our tree out. My dad and the man selling Christmas Trees sawed the top off right there in the parking lot. I'm sure the measurements were correct right down to the last centimeter, with Val overseeing the project. At home, my father mounted the tiny tree into an over sized metal stand made for a seven foot fir. After Karyn and I adorned the branches with glass balls, candy canes and homemade gingerbread men, Dad hoisted our tabletop tree onto its wooden perch in the living room. 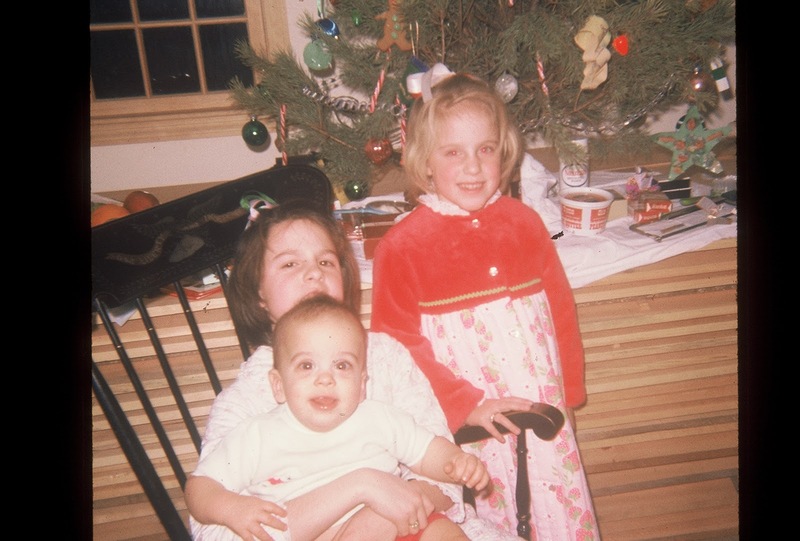 I was so happy about that little tree, deliriously happy about Santa Claus' eventual arrival and all the presents that I would find under our diminutive holiday evergreen. If you want to scent your home with ginger and molasses this holiday season, here is the recipe from Val's Woman's Day Encyclopedia of Cookery that we make every year. If you look closely at the photo in the top of the post, you will see one hanging on the tree. Remove about 1/2 cup of dough from refrigerator. Keep remaining dough chilled until ready to use. Roll out on floured board to 1/4"-1/8" thick. Cut with floured cutters and place on ungreased cookie sheets. ( I use Silpat liners but parchment paper would also work well.) Bake for 10-15 minutes until just before cookies brown on edges. Remove from oven and allow cookies to rest for 5 minutes. Transfer to wire racks and cool completely before decorating with frosting, sprinkles, etc. 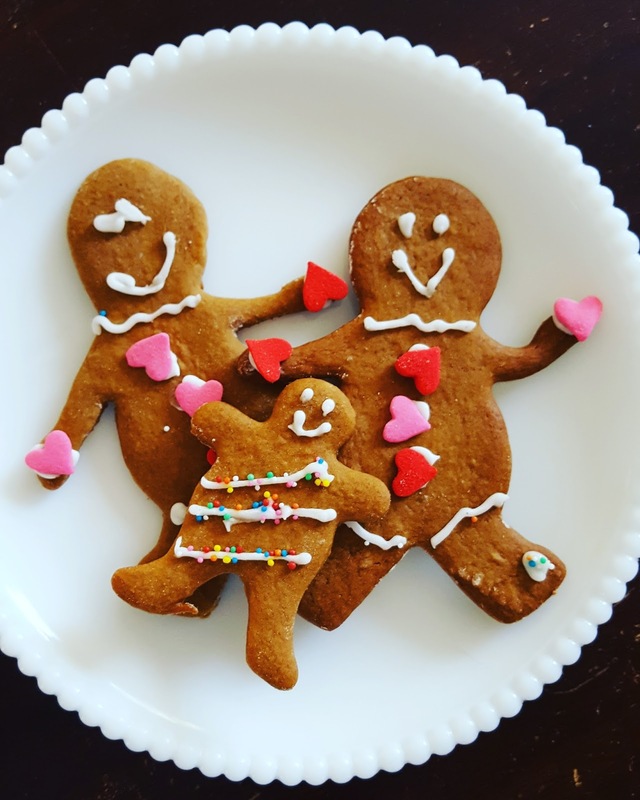 *If you want to hang these on your tree, make a hole twice as large as you want the finished product in the top of each cookie BEFORE baking.